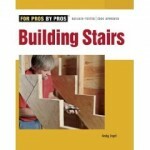 Recently I wrote an article about how to build stairs. Since then I’ve had inquiries about some type of calculator or spreadsheet to quickly calculate the rise and run measurements for the stringers. So I sat down and put together a quick Excel spreadsheet that helps you calculate the total number of risers, riser height and tread run. 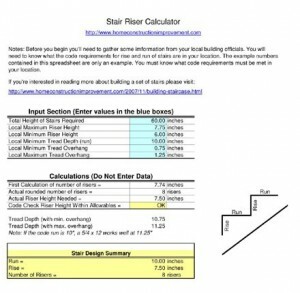 You can download the FREE Stair Calculator here. All I ask is that you check with your local building officials to make sure you’re following the applicable building codes. Also, if you share it with others please leave the website address on it. Total Height of Stairs Required – This should be the height from one finished floor to the other finished floor, measured vertically (plumb). Local Maximum Riser Height – This is the maximum riser height allowed by the building code. Be sure to check with your local building code official to be sure you’re current. Typically this number ranges from 7 inches to 8 inches. Local Minimum Riser Height – Again the building code will specify a minimum riser height. Local Minimum Tread Depth (run) – This is the minimum tread depth allowed by code. This is measured from the face of the riser to the face of the adjacent riser without the tread nose. Local Minimum Tread Overhang – This is the minimum nosing overhang measured from the face of the riser to the front edge of the nosing. This is typically limited by the building code. Local Maximum Tread Overhang – This is the maximum nosing overhang measured from the face of the riser to the front edge of the nosing. This is typically limited by the building code. Once you have this information you simply enter it into the stair calculator in the blue boxes. The spreadsheet will calculate the rise and run for the stringers and show that information in the yellow boxes. It’s really as simple as that. Once you’ve figured out the stair geometry you should figure out what materials you’re going to use for the stairs. Stairs can be as simple as 2×12 stringers with plywood risers and treads and as complicated as steel stringers and beautiful hardwood treads. If you plan on using wood stringers then I would recommend you at least use 2×12 lumber. Today most all stairs that I build end up using 11-7/8″ TimberStrand stringers. They are much stronger than traditional lumber and less likely to split at the apex of the tread/riser cut. Check out the following books if you’re looking for some great references for your library. There are a number of primitive stair stringer calculators available on the internet. However, this one looks much more detailed; great job! hope this stair calculator works. My husband has racked his brain to make the stairway in our new house have a landing without cracking your head on the floor upstairs. will let you know the outcome. Thanks. @ Warren – Thanks for stopping by….let me know if you have questions as you work on your new stairs. Thanks for the help I have a 2nd story deck which was to be a fire exit. This will encourage me to try again on the stairs. Yes, you must have all steps within that 3/8″. Those calculators are helping offset the flooring depths, the stringer cuts are not the final step heights.